Modern SLR cameras and camcorders allow you to shoot high-quality video, but there are problems with sound, as the microphone is of poor quality. For this reason, it is worth buying a good microphone for the camera and you can shoot high-quality video with good sound. 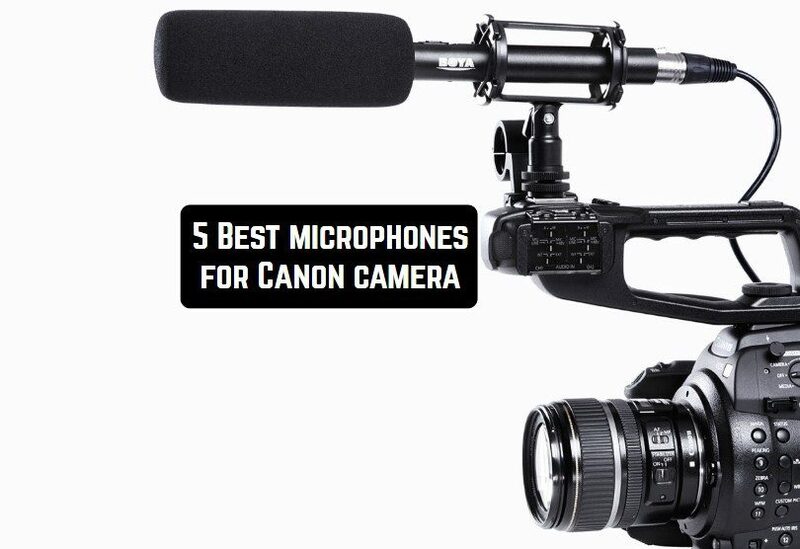 To the attention of our readers, we offer 5 Best microphones for Canon camera. Rode VideoMic GO is a lightweight video mono microphone gun. 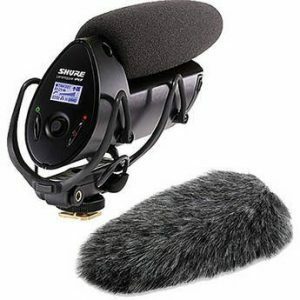 VideoMic was designed specifically for recording human speech at a distance of 2 meters. The microphone works for 100 hours from only one 9 volt battery. Rode VideoMic has a vibration-suppressing mount and adapter for attaching to the camera’s hot shoe. Connects a microphone to the device using a 3.5 mm jack. In the process of recording, the microphone doesn’t catch unnecessary noise. VideoMic is made of polycarbonate, which makes it reliable for everyday use. A microphone can withstand minor shocks from falls or other external contacts. A high-pass filter is available in the Rode Video Microphone. This feature is useful when recording outside. The rumble of wind and other unwanted interference on a busy highway in the middle of the working day are suppressed. Rode VideoMic Go is a very good microphone, however, it is the largest of the tested analogs. Of course, if we had a choice between a built-in mono microphone in the camera and Rode VideoMic, then we would prefer the second option. 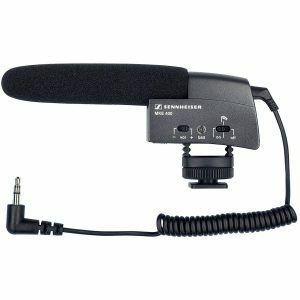 Sennheiser MKE 400 is a regular mono microphone that has been tested for compatibility with the Canon EOS 5D Mark II camera. The MKE 400 is the smallest and lightest microphone among all tested. The microphone has a metal structure, 2 sensitivity functions, and a high-pass filter. Powered by one AAA battery. The microphone can be attached to the camera’s hot shoe. The plug for connection is also compatible with the 5D MkII. The length of the microphone is ideal for continuous use with a camera. You can take pictures all day long (the microphone will not bother you to look into the optical viewfinder), and if you need to record, you will simply need to switch the camera to video recording mode. On the Sennheiser MKE 400 microphone, there is a special coating that reduces noise caused by the roar of the wind. It also has a number of functions described by us in relation to the previous microphone. If you pick up the microphone, guided by the practicality and compactness of the product, then Sennheiser MKE 400 is the most suitable device for recording sound. If we had the honor of choosing a mono microphone between the Rode VideoMic and the Sennheiser MKE 400, we would stop at the Sennheiser. Moreover, the Rode VideoMic is slightly inferior to the MKE 400 in terms of recording quality. 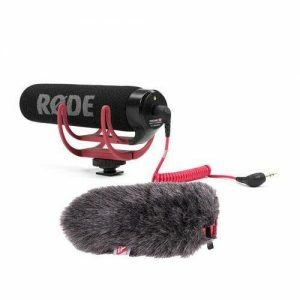 Microphone Rode Stereo VideoMic Pro is built on a perfectly matched pair of high sensitivity 0.5 inches cardiogenic condenser capsules angled at 90 degrees. This allows you to get a wide stereo sound with natural depth. 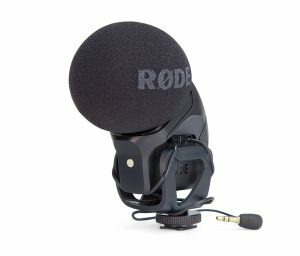 The Rode Stereo Video Pro microphone has all the features of the Rode Video Pro Microphone, and is ideal for digital SLR cameras, semi-professional and professional camcorders. The built-in mounting system provides isolation from vibration and mechanical noise that can affect sound quality. In addition, the lightweight but durable multi-core cable provides excellent acoustic isolation from the camera and provides lower noise compared to traditional audio cables. On the back of the microphone, there are buttons to control the equalizer and power. The 75 Hz high-pass filter removes noise from air conditioning, transport, or other unwanted noise at low frequencies. Lowering the sensitivity of the microphone to -10 dB, allows you to record noisy events such as live concerts and sporting events. As with the VideoMic Pro, the output level is increased by +20 dB, which provides high-quality sound when working with SLR cameras. When this feature is activated, the camera’s low-quality preamps provide lower noise and clear recording. This is a LensHopper VP83F, a compact cannon microphone that is designed to be mounted on a camera instead of an external flash. The manufactures promised high-definition audio with low noise, a wide range of frequencies, high sensitivity, and other buns. The microphone, as it should be – a narrow, supercardioid. Additionally, protection is also provided against RF interference, for example, the radio signal of a mobile phone nearby. There is a three-position gain switch (-10 dB, 0, +20 dB) to compensate for different recording conditions, a filter that cuts off low-frequency noise. Operating time from 1 AA battery is 125 hours. For isolation from the camera body, the Rycote Lyre mounting system is used, which eliminates noise and vibrations during operation. The Shure VP83F model, in contrast to the already existing solutions (VP83), can not only give the camera sound through a 1/4 ″ connector but is also capable of recording high-quality sound for later synchronization with the image during editing. For this purpose, there is a built-in recorder thst runs one (red) button. And it records WAV 24-bit/48 kHz files on a microSDHC card. An easy-to-read backlit LCD screen gives you complete control over your device’s activities, including audio levels, battery power, track information, headphone volume, microphone gain, filter on, and remaining recording time. The five-way joystick provides advanced features for controlling functions; the gain is fully adjustable, up to 60 dB in 1 dB steps. Rode NTG-2 – a thin and light, narrowly-focused microphone-gun for shooting staged scenes and journalistic reports. This microphone requires additional (phantom) power but can work with any devices, even those that have only linear inputs. It is enough to insert a battery into the microphone, and it can be connected to any video camera or recorder with a line input. The Rode NTG-2 microphone works in the full frequency range, it is low-noise, very sensitive and is able to effectively cut off background noise from sources outside the action field. For work in the conditions of the street, it can be used with the “DeadCat” fluffy windscreen (purchased separately). 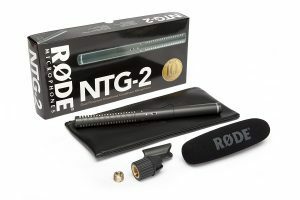 The manufacturer provides a ten-year warranty for ITS Røde NTG-2 product. 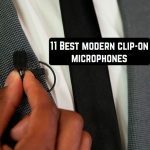 Undoubtedly, the main advantage of on-camera microphones is sound quality. With their appearance, users have the opportunity to shoot video clips anywhere and anytime. That is, you can purchase any camera and create 1080p video quality. But what about sound quality? A microphone for a video camera is an external device that is used to get high-quality sound during video recording. Carbon and other various sound recorders. In order your microphone for a Canon camera to serve faithfully, you must first decide in what conditions it will work and only then select the desired model. Electrodynamic (bobbin) microphone. The principle of operation is based on the induction of electric current. The advantage of such microphones is their high durability, reliability, and ease of handling. They do not need a power source, they are cheaper than other types, they are not damaged by a loud sound. It takes a lot of effort to set the membrane in motion, as it is rather heavy, as a result, the sound quality and duty cycle is worse than that of its competitors. They do not work well with weak sounds and are sensitive to interference. Condenser microphone. An electric current amplifies the signal and transmits it to a capacitor (a membrane with a counter electrode). Sensitive membrane works well with a quiet sound, the best porosity, the sound of better quality. High cost, sensitive to mechanical damage and moisture, a power source is needed, high sensitivity to extraneous noise. Carbon microphones. They have poor sound quality, so they are rare, although they used to be very common. They met in each intercom and in each telephone. Electret Microphones. 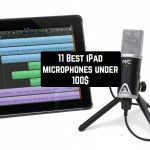 They are similar in type to condenser microphones, but they do not require an external power source, they have enough batteries. Good for outdoor use. Mainly used in lavalier microphones. As for the range, the optimal distance is considered to be 50-60 cm, and when using microphones with a high-frequency filter, the distance is reduced to 10 centimeters. Buying microphones for cameras is not an action for most users of photographic equipment. For a simple man in the street, it is quite enough to have ordinary, budget model of the camera with built-in microphone.